Hey Baby! The Queen is open for the week of the Dirty Dancing Festivall! The Queen has been casting her spell on visitors to the Hickory Nut Gorge for over 80 years. She's been lovingly renovated and is ready to work her spell on you. Make plans now to visit for a memorable getaway. The Queen of the Lake’s magic starts when you arrive. Even the views from the off-street parking are mesmerizing. There are just a few short steps down to the entry and the first of many decks for enjoying the outdoors. Inside, the newly expanded Great Room lets you enjoy the majestic panorama in air conditioned comfort. The comfortable furniture will entice you to grab a book and settle in, but you'll still be attracted to the wonderful scenery just outside the window wall. As the sun goes down, you'll want to gather together in the screen porch--with fireplace #4 and flat screen TV #4--or on the deck to review the excitement of hiking at Chimney Rock Park, located just minutes away, or other adventures like visiting TIEC, Biltmore or many local vineyards. This is a great house for a group gathering, with room for ten. Two of the bedrooms are on the main floor. The master suite has a King sized bed with a new en-suite bath with shower, TV #2 and fireplace #2. The other bedroom on the main floor has Twin beds and fireplace #3 and share the second upstairs bath-with a new marble tub/shower combo. Downstairs is another Queen bed with en-suite bath with shower, plus an entirely new downstairs master bedroom with a Queen bed and en-suite bath with shower. (All bed and bath linens are included in the basic rate.) If you need to accommodate more folks we have an airbed with linens--The kids think this is great fun! You'll enjoy numerous spots for sunbathing and swimming plus other numerous outside activities and nearby tourist sites. Otherwise you can cozy up and read or watch your favorite TV or DVDs, and there’s enough space that one part of your group won’t interrupt the others. And, of course, there is free wifi. We now offer 2 paddleboards ,2 kayaks and lots of inflatables for our guests--NO EXTRA CHARGE! We were invited to visit friends at their Lake Lure cottage in the summer of 2012. When we left we realized that Lake Lure was one of those special places in the world that deserved a second visit. Our second visit that following fall began a quest to find a second home there. The beauty of Lake Lure tucked amongst the mountains together with the peacefulness of the laidback attitude of the lakeside families was very appealing. During this quest we looked at many homes, each with their strong points and weak points. Finally in early 2013 we found the perfect lake home that met all of our wants and needs. The home is conveniently located half way between the town of Lake Lure and the Ingles Supermarket. It is located on the Lake where the main channel meets the heart of the Lake, offering views that are magical. There is ample parking right next to the house for easy access. Also there is a gently sloped walkway leading to the lake and boathouse. Once at the lake there is a conveniently located lakeside cabana with a functioning bathroom to save trips back to the house when nature calls. When the sun sets, the views from the boathouse deck are hard to beat. Everything is in place for a perfect vacation week. All four bathrooms have a shower. One of the upstairs baths also has a tub. Expansive lake frontage with a No Wake Zone extending for 75 feet out from the shore. Views of Rumbling Bald, Round Top, Young's Mountain and Bill's Mountain. Gas fireplaces in the Great Room and each of the two bedrooms upstairs. Wood burning fireplace on the screen porch. Skyrunner internet (the fastest, most reliable internet service at Lake Lure). Updated kitchen with Kitchen Aid appliances and granite countertops. TVs located in the Great Room, the upstairs Master, the downstairs Library and the screen porch. Sonos is available throughout the main level and on the deck. The Queen of the Lake has an enclosed balcony, plus 3 sun decks at the lakefront. The main deck is at the level of the main floor. Two SUPs (Stand Up Paddleboards) are included FREE. Inflatables are also included. 5 minutes from a 9-hole municipal golf course and 15 minutes from two 18-hole courses at Rumbling Bald Resort. There is a swimming area that is protected between the boathouse and a separate water-level swimming platform. 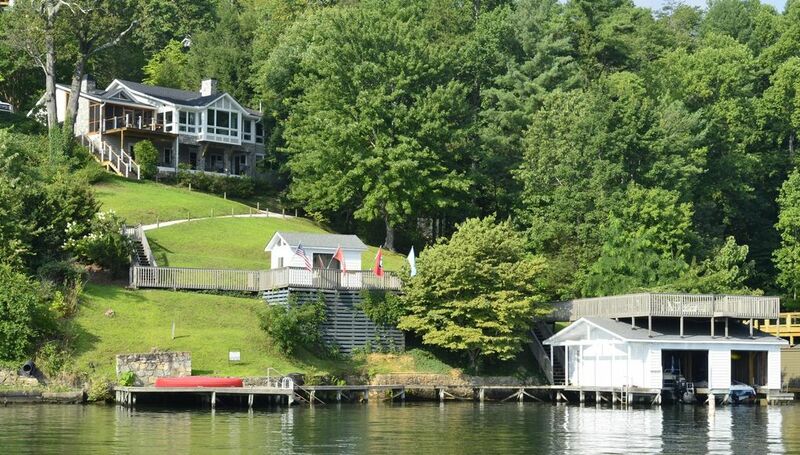 More adventurous swimmers will enjoy leaping into the lake from the top of the boathouse. Convenient to Tryon International Equestrian Center. Only 25 minutes away. The Queen of the Lake was everything and more then we expected. Wonderfully renovated and the perfect location. Definitely deserves the title of " Queen of the Lake"!!!! Our family decided this was the favorite of all the homes we've rented over the past 8 years! From the beautiful , comfortable ,roomy home with all the amenities we could ever want or need, to the beautiful views and water sports for the kids, we couldn't have been happier. each morning. It would have been nice to have an umbrella to shade the rising sun ,just as a suggestion. Thanks Ken for all your help. Hope we'll be seeing you again next summer. Our visit to Lake Lure, and staying at the Queen of the Lake was spectacular! It was a great location on the lake & the view was amazing! It was awesome to sit on the balcony for morning coffee, watch the boats go by, or the sunset in the evenings. Our stay was during the 4th of July and we had a great view of the fireworks display. Our children specifically loved jumping from the top of the boathouse. It kept them busy all day! The house couldn't be better! It was completely renovated with many added amenities. Ken Jordan, our rental agent, was great to work from beginning of our first communication. He quickly responded to my phone calls/emails and provided us with helpful information which made our decision to rent the Queen a very fast one! He greeted us when we arrived at Lake Lure. He even offered to cook our family a true BBQ dinner! What a treat! We cannot wait to return to Lake Lure for our vacation next summer and will definitely be renting the Queen of the Lake. There is no better place to stay and working with Ken Jordan was the best! Second time in this home; The remodel done recently is unbelievable! Lots of comfortable spaces! Queen of the Lake is an amazing property. The pictures don't do it justice. The views are expansive and perfect. The build level and finishes of the home are top quality. Ken was great to work with, he is courteous and quick to respond. I can't imagine a better lake house setup. Lake Lure is a beautiful, private lake nestled in the NC mountains. The views, the water, area in general, is great. This home has been very tastefully remodeled recently, The kitchen, bedrooms, outdoor spaces, furnishings are all refined, but fun. The house has open spaces with great views and plenty of seating, couching, cocktail hour spots, etc. And the waterfront, with the multiple docks boathouse, diving platform, kayaks and paddleboards, is a blast. Ken Jordan, the property manager with Lake Guys, could not have been more helpful and accommodating. He even introduced us to some wonderful people that stored our boat trailer for the week. If you want a great lake vacation with something for everyone, this is the place! Thanks for the kind words. We try to make folks' visits as enjoyable and hassle free as possible. We hope you'll join our group of return visitors. Many local hiking trails are nearby, using land protected by the local conservation groups. The Tryon International Equestrian Center is only 30 minutes away. Board your equine friends at the TIEC and you can quickly be there for your show. Note the minimum stay is for 7 nights. Check in is at 5PM on Sunday and check out is on the following Sunday at 10AM. PAYMENT NOTE: If you are asked to pay by using a bank transfer, please be advised that LakeGuys Realty DOES NOT use that method. Anyone soliciting payment by a bank transfer is not associated with this rental. If you have questions, please phone Lake Guys Realty at 828-691-5009.